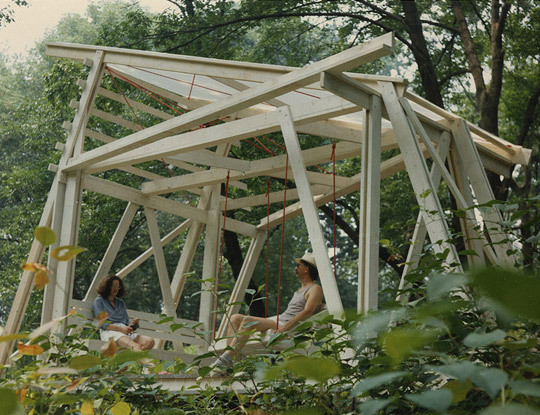 Swing Pavilion was created for a summer exhibition in the Arboretum in Fairmont Park in Philadelphia sponsored by the Philadelphia Art Alliance. 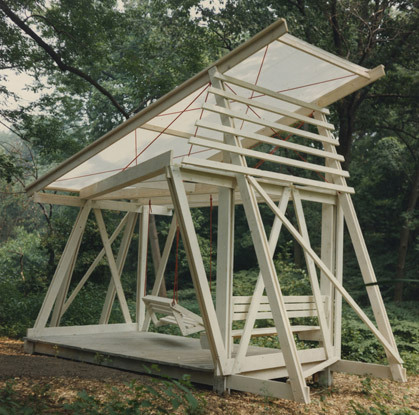 This pavilion was designed to provide a stimulating site sculpture as well as a sheltered place to contemplate and enjoy the landscape in a little used corner of the Arboretum. Situated near a small brook, it was intended to be viewed from many different locations along the nearby paths and road. The swinging bench came just up to the edge of the pavilion, allowing the user to hover for a moment near the small ravine. The structure and its many angled forms were abstracted from the trunks and limbs of the surrounding trees. The pavilion was in the park from May, 1987 to May 1988. It was then moved to a Brant Lake Camp in the Adirondaks.